COME & SPICE UP YOUR LIFE ! Latin Quarter SPICE night – Fri 23rd June @ Chamber East, Chamber buildings, Panmure St Dundee DD1 1EP (behind the McManus galleries). There will be latin music to groove too, an Argentine tango taster class (8.15pm), Tribal belly dancing performance ( later in Eve), and a Beginners taster salsa class at 7.30pm. Chamber East has a lovely big wooden dance floor, anyone welcome, bring friends & family. Doors open 7.30pm, on till 12.30am. Entry £8 full price or £5 for students, pay on door or tickets from Tuesday Deaf Hub salsa classes. There will be a raffle too. All money raised goes to the Azul Wasi project for former street children in Peru. Email LQsalsadundee@gmail.com for more details. Any raffle prize donations would be gratefully appreciated. Pop a poster up if you can help pass the word. 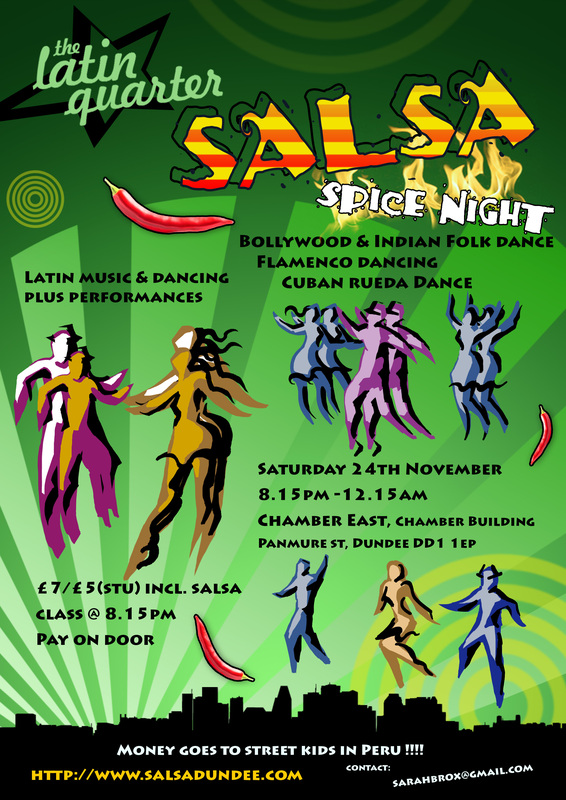 Latin Quarter SPICE night – Sat 24th Nov at Chamber East, Chamber buildings, Panmure St Dundee DD1 1EP (behind the McManus galleries). Chamber East has a huge lovely wooden dance floor. There is latin music to groove too and performances of Indian folk dance , Bollywood dance, Flamenco dance and a Cuban Rueda Salsa demo. Includes Beginners taster salsa class at 8.15pm. Doors open 8.15, on till 12.15am. Entry £7 full price or £5 for students, pay on door. There will be a raffle too. Pop a poster up if you can help pass the word. All money raised goes to the Azul Wasi project for former street children in Peru. Email sarahbrox@gmail.com for more details. Latin Quarter SPICE night – Sat 24th Nov at Chamber East, Chamber buildings, Panmure St Dundee DD1 1EP (behind the McManus galleries). Chamber East has a huge lovely wooden dance floor. There is music to groove too and performances of Indian folk dance , Bollywood dance, Flamenco dance and a Cuban Rueda Salsa demo. FREE Beginners taster salsa class at 8.15pm. Doors open 8.15, on till 12.15am. Entry £7full price or £5 for students, pay on door. There will be a raffle too. Pop a poster up if you can help pass the word. All money raised goes to the Azul Wasi project for former street children in Peru. Email sarahbrox@gmail.com for more details. 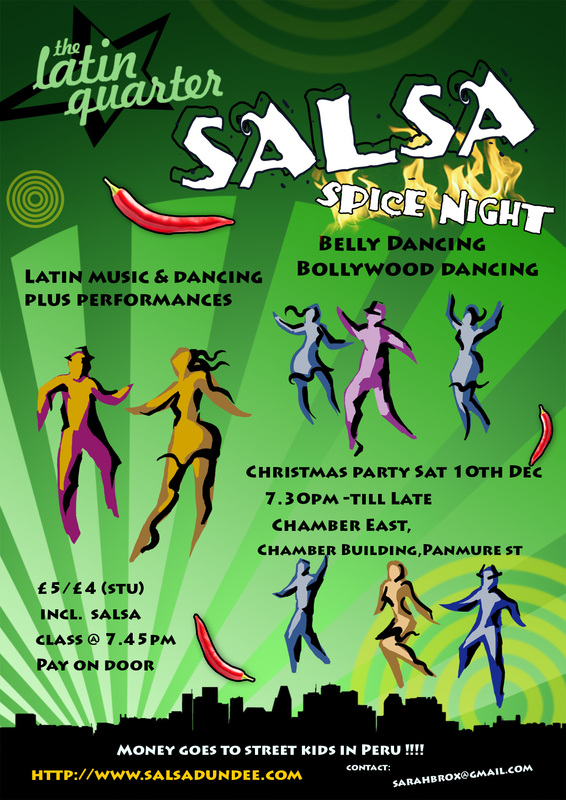 A date for your diaries, SPICE night on Sat 24th Nov at Chamber East, Dundee, if you’re new to LQ salsa classes or events a Spice night is held about twice a year, it’s a Latin dance social with a twist, performances or join ins with dance or music from the spice countries. Past performers have been Bollywood, Belly dancing, Flamenco, African drumming, salsa demos etc. Performers & timings for 24th to be confirmed, further details to follow. Latin Quarter Charity SPICE night / Christmas social Sat 10th Dec at The Chamber Suite ( new name Chamber East), Panmure St, Dundee DD1 1DU. Pay on the door, £5 or £4 for students.There’s a raffle too, all proceeds go to the Azul Wasi project for street children as usual. Timings : Doors open at 7.30pm, free beginners salsa class at 7.45pm followed by music for dancing, 9pmish Bollywood demo, 9.30pm bellydance demo 1, 10.10pm bellydance demo 2 & join in, 10.40 Raffle, followed by music for dancing & line up. Latin music for dancing inbetween dance demos. Hope you can make it !